I always think of myself as being 'not all that' at handy crafts so it was a pleasant surprise to see how easy some of them can be. On Friday The Fat Controller gave me a shed he'd found while hiking in the highlands of Scotland. Regular readers will know that BoB brought round a whole box full of knives and assorted kit from our folks place.Lying unloved at the bottom of the box was the knife pictured above. 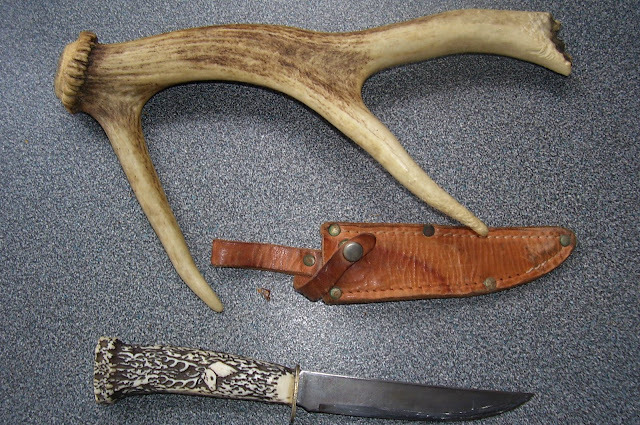 It's handle a particularly unconvincing piece of faux antler (note the 'charming' depiction of a stag!). The blade had several different grinds, in parts flat,and convex, is also pretty soft steel. 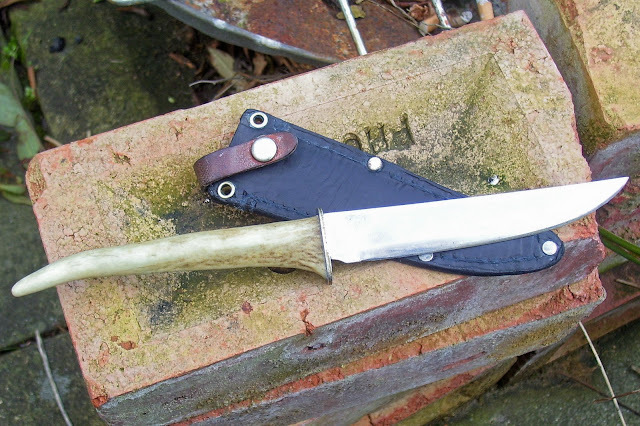 It was the kind of knife given to lads as a first sheath knife. 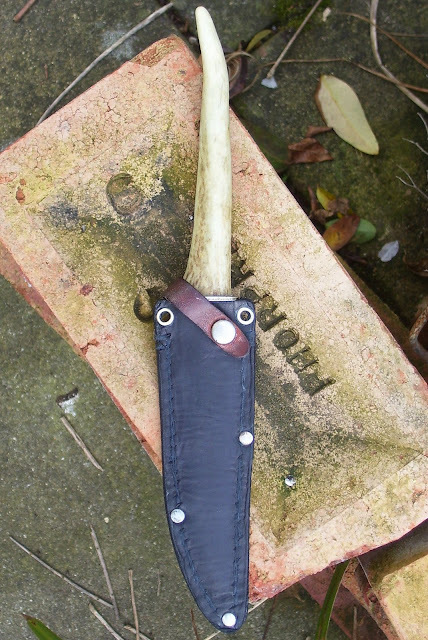 The sheath itself was pretty cruddy, the leather un-nourished and the stitching failing or failed. A few hours later and it a whole new story! Antler is much easier to work than it looks at first sight. I cut off the bottom left tine with a hacksaw, used the side of an angle grinder blade to sand the surface that meets the finger guard, trued it with an orbital sander. It stinks! Like burning fingernails!! Drilled the first hole with 4mm wood bit in a powered screw driver. Making the hole into a slot to take the blades tang looked difficult, but once I'd convex'd the point of a pig-sticker (you know a spike on a handle - don't know its real name) into a mini blade - it was surprisingly easy to get the recess the right size and shape. I used two-part glue to set the blade to the tine. The sheath wasn't in good shape so I roughed off any remaining finish and stained it blue, did some lacklustre back stitching, stained it again to cover up the crappy stitching, and using the cooker hob as a heat source melted four coats of boot wax into the leather. 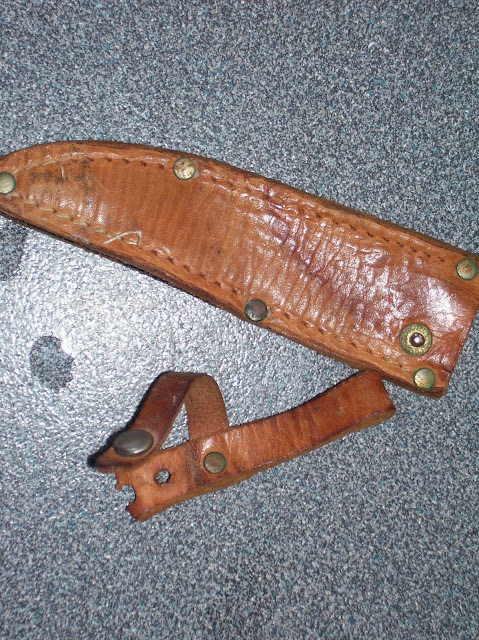 I left the retaining strap in the original colour, took out two rivets from the top of the sheath and replaced them with hollow rivets so the knife can be worn dangling as a 'necker'. All it needs now is a boot lace to hang it from. Now if I could just get on with that Kuksa.